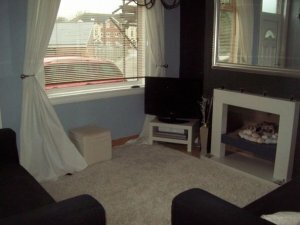 A modern two bedroom terraced house is available to let, fully furnished in Woodseats Sheffied. The property comprises of a large kitchen with integral fridge/freezer, washing machine, cooker and hob and feature breakfast bar. There is a spacious living room complete with a marble gas fire. A large double master bedroom with walk in wardrobe and a 2nd double bedroom with a further large wardrobe for storage. The bathroom is complete with a spa bath and rainfall shower head. There is a landscaped garden to the rear of the property and a cellar and attic and there is ample parking to the front. Situated in the heart of Woodseats Sheffield, the property is close to all local amenities, transport routes and is a short distance from Sheffield town centre.